SmartMove can make the difference. You create an account and send your potential tenant an invite. Your potential tenant receives screening invite & completes their application. We verify and send you the tenant's reports. Designed specifically for tenant screening. SmartMove tenant credit checks use ResidentScore to predict eviction risk 15% better than traditional credit scores. Over 370 million criminal records from state and national databases. One of the largest evictions databases subject to the FCRA with 27 million eviction records, covering all 50 states plus Washington D.C.
Know which applicants need additional verification, skip the rest. SmartMove is very convenient to use. I like that the process is all online, the speed and accuracy of the reports, and that the service is backed by a company as well respected as TransUnion. I had much more confidence after using SmartMove that the tenant I picked would be excellent – and they were, always paid on-time and were responsible tenants. The average eviction costs $3,500. TransUnion SmartMove is the convenient tenant screening service for people who don't manage hundreds of properties. Screening tenants used to be just for large professional property management companies. It's easy to understand why: pulling certain types of reports like tenant credit reports isn't possible for most individuals. This includes resident screening for many rental property owners, real estate agents and even small property management companies. TransUnion changed that with the patented SmartMove tenant screening product, adding convenience and wide accessibility into tenant background checks. In a nutshell, SmartMove allows rental history reports to be delivered to the landlord (or rental property owner, real estate agent or whoever is in charge of screening applicants) while protecting consumer information in a manner consistent with the Fair Credit Reporting Act and applicable regulations. And… it's completely paperless and online. It's free to sign up for an account. Accounts can be created and screening reports delivered in a matter of minutes. There’s no fee for a membership because SmartMove offers pay-as-you go. Only pay for the reports you need. Additionally, SmartMove enables landlords the choice to pay themselves or pass the cost of background screening onto your tenants. Now renter credit, income estimate and eviction reports plus criminal background checks are available to all landlords and property owners. All of this information is contained within one easy-to-read tenant background check report. A key to picking out the right renter is to have quality tenant background check information, including an eviction history check, to help you make your decision. And, TransUnion SmartMove tenant screening services offers exclusive benefits and features that are designed to help landlords make more informed decisions. 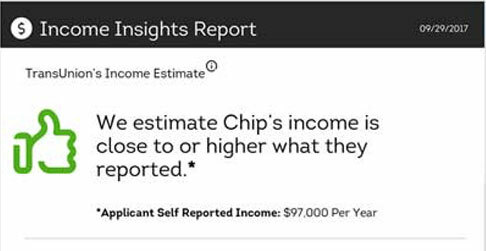 Income Insights: Our proprietary tenant background checks offer Income Insights, a custom report that tells landlords which applicants need additional income verification. This report can help you save time and effort during the tenant screening process and lowers your risk for renter payment issues. ResidentScore 2.0: THis credit measurement is built specifically for tenant screening and delivers a more accurate assessment of renter risk than a typical credit score. According to TransUnion research, ResidentScore predicts evictions 15% more often in comparison to a typical credit score in the bottom 20% score range where risk is greatest. Along with tenant screening reports, SmartMove delivers a credit-based recommendation based on the applicant's ResidentScore. A landlord credit check is an important step to evaluate your applicant. And, we know you base your leasing decision on more than just a credit profile or renter balance sheet. But as a consumer reporting agency, TransUnion leverages its decades of experience to offer ResidentScore 2.0, a credit score tailored specifically for the rental industry, helping you better assess an applicant's risk. Use credit checks designed for tenant screening, and find high-quality tenants faster. A TransUnion tenant background check allows your applicants to share their histories while also protecting their personal identifying information. Renters who use SmartMove tenant screening services submit their personal information directly to TransUnion online, without having to provide sensitive information (such as a social security number) to the landlord. Ultimately, they like us because we help them get the rental they want while making them feel comfortable in sharing their personal information in a convenient, online solution. *The Criminal Report is subject to federal, state and local laws which may limit or restrict SmartMove's ability to return some records. 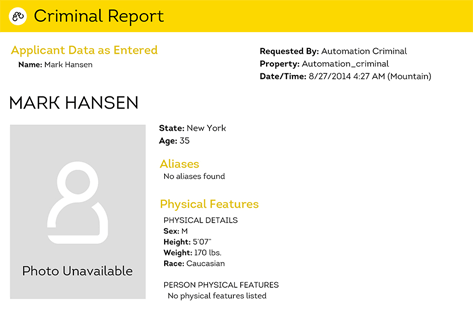 **Instant criminal results not available for Wyoming, Delaware, South Dakota and Massachusetts.